The Personal Inventory Template can help you get through a robbery or fire by providing your insurance company with the information and proof you need to get back to normal. This free template lets you organize, catalog, and store all your valuable possessions in one convenient document. This template was designed to be simple so all you need to do is download the document below and let the template guide you as you enter all your precious items. Learn more about the Personal Inventory sheet by reading the instructions provided for you below. To download this free template, all you’ll need to do is click the link at the bottom of this page. Begin editing this document in the “Lists” tab at the top of this page. This is where you will enter the categories you will use throughout the rest of the document. For example, you can use the examples listed (art, games, books etc.) or you can create your own system, such as the rooms where you keep your items, whichever you prefer. The next step is to use the “Inventory” tab to list the details of your items. You will want to list a name, the category, a brief description, and finally the date you bought the item. You can then go to the “Summary” page for a detailed overview of all the information you entered into the document so far. 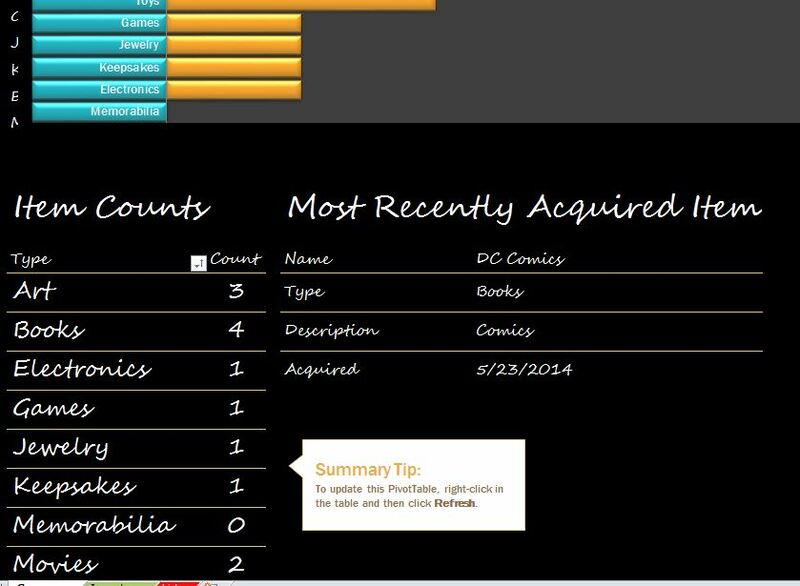 This section will keep track of the items by category and list the amount of items for each category you have and provide you a helpful visual in the form of a graph as well. There will also be a section to list your most recently acquired possession towards the bottom. These will simply be the last items you purchased. You can see how easy it is to keep track of the things you enjoy and get them back quickly in an emergency.